I ink, therefore I yam. 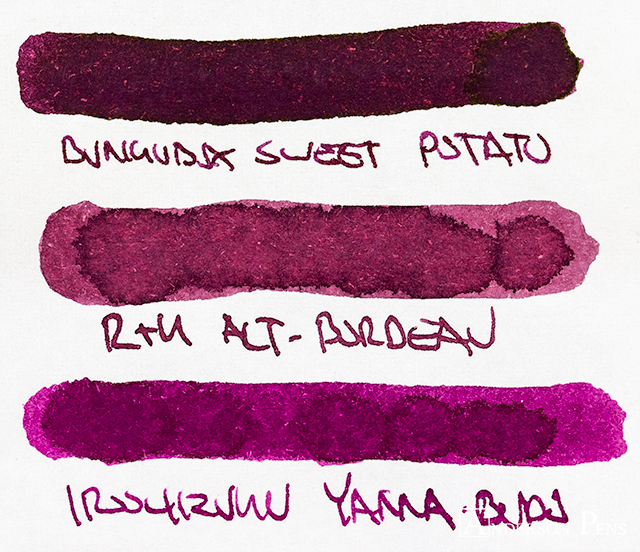 Bungubox inks are the top tier of fountain pen inks. The price jump from a bottle of Diamine to Bungubox might seem extreme, but I’ve found that the expense is justified. 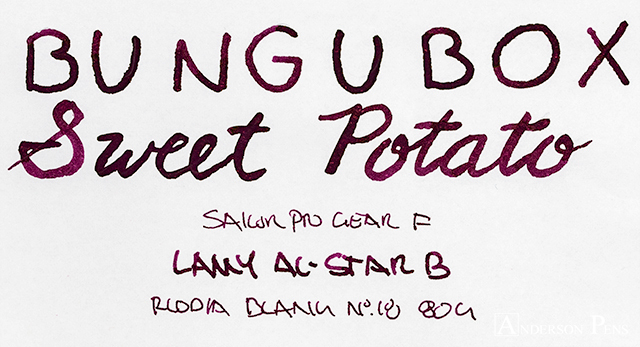 Sweet Potato is a beautiful raisin plum color that provides a luxurious writing experience. 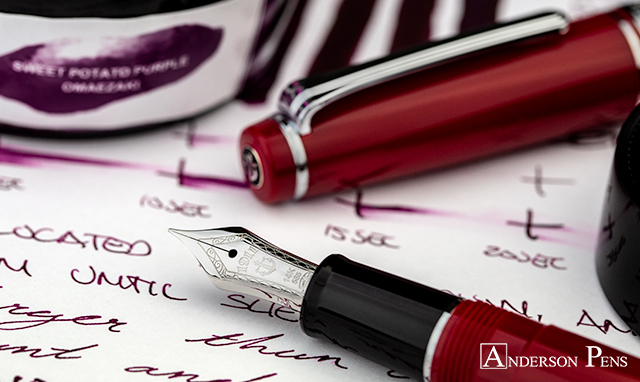 Bungubox inks are produced by Sailor and come in the same 50ml round glass bottle. This review was done with a Sailor Pro Gear F, Lamy AL-Star B and on Rhodia blank No. 18 paper. 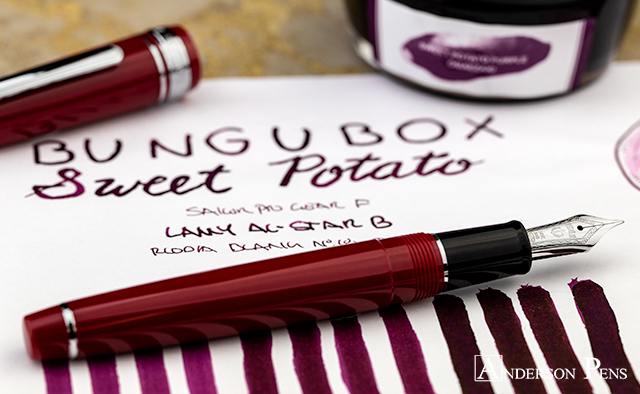 Bungubox Sweet Potato is a beautiful mulberry maroon color that shades decently. The lightest the ink gets is a soft magenta color. From there, it shades to a plum and finally to a rich raisin wine. 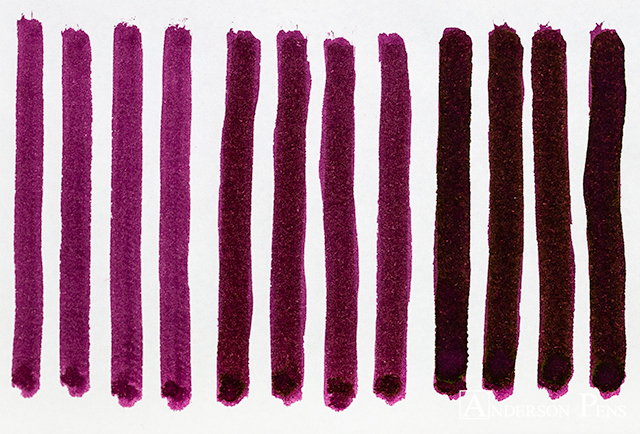 What really sets this color apart is its vibrant sheen. Even on Rhodia and Clairefontaine, but especially on Tomoe River paper, Sweet Potato has an incredible golden-green sheen. Somehow, Bungubox inks perform even better than Sailor. 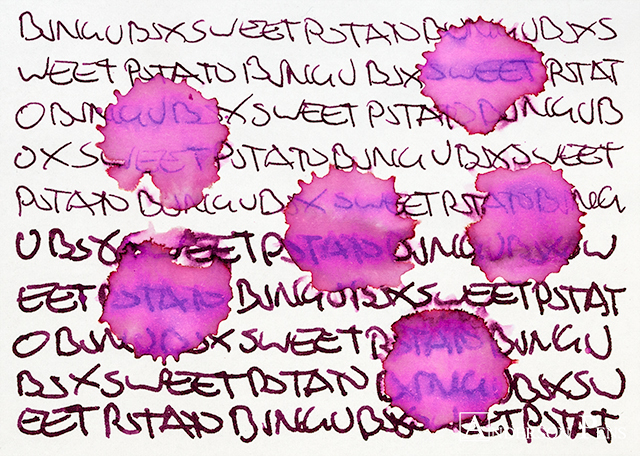 Sweet Potato had good flow with no feathering or bleedthrough on Rhodia paper. 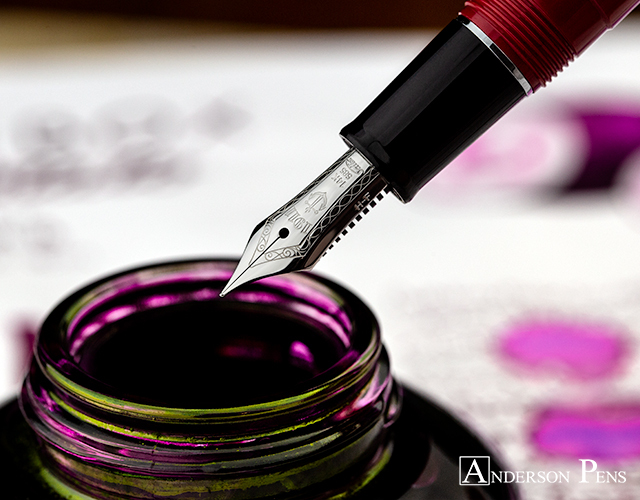 It’s a moderate to highly-saturated ink with good dry times at 20-30 seconds. While I wouldn’t say that that the ink is water-resistant, it was easy to make out the writing after the water test. 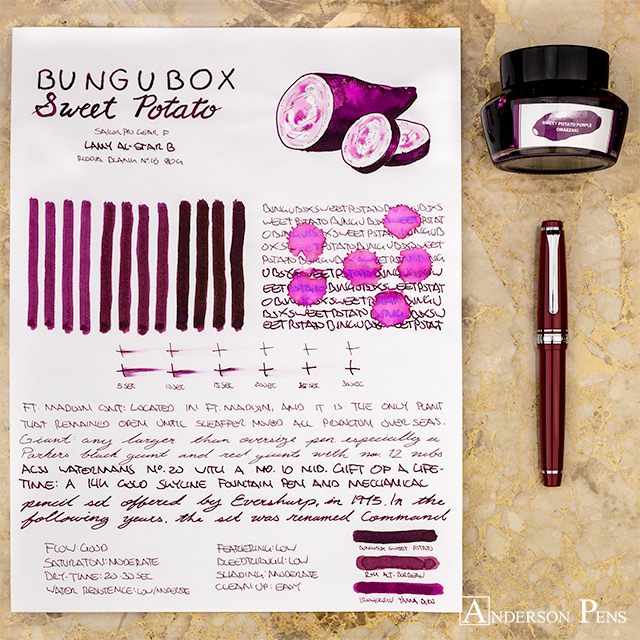 Yes, Bungubox inks are expensive, but there is something special about them. The properties are great, the colors are unique, and there’s that one little thing that sets them apart. 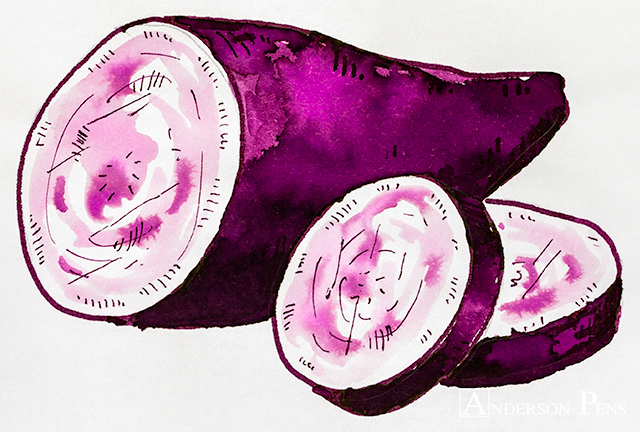 Aside from its gorgeous color, Sweet Potato has that incredible sheen. Whether that’s enough is for you to decide; as for me, I’ll be inking it up. This entry was posted in Ink, Ink Reviews, thINKthursday and tagged Bungubox, ink, ink review, Sailor, thINKthursday. Bookmark the permalink.